Changes to the Standards Program? Not So Fast, DOE. 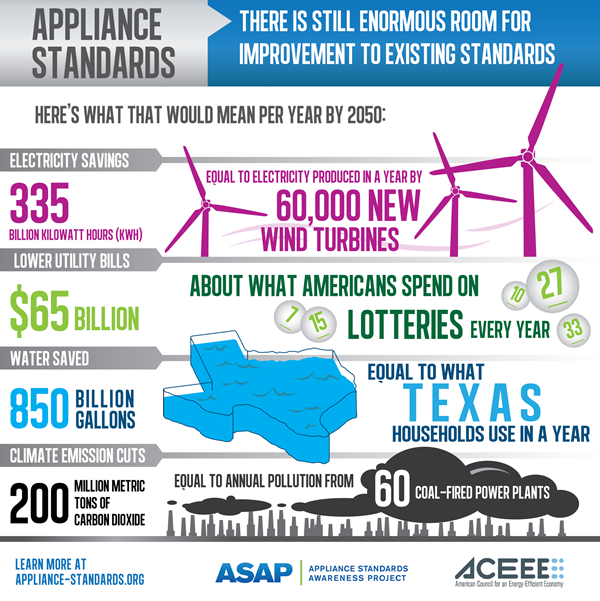 The federal program that sets minimum energy efficiency standards for the appliances, electronics, and equipment we use every day has been an unequivocal success story. Yet, the U.S. Department of Energy (DOE) is toying with some changes that could compromise the effectiveness of the longtime program saving the average household more than $500 in energy costs every year. The DOE will hold a meeting next Tuesday (January 9) to launch the discussion about changes to its longtime standards-setting process. We’ll be there, along with others who will push back on any modifications that would undercut the program, which was started in the Reagan administration and will save consumers $2 trillion on their utility bills by 2030. When it comes to a program as technically complex and impactful as the appliance standards program, following a good process is really important. While it’s always good for the DOE to look for ways to improve its processes, any changes that make the program less effective, create roadblocks to progress, or make it harder for DOE to set strong standards should be nonstarters. For example, DOE seeks feedback on when they should use the Direct Final Rule mechanism, which streamlines the rulemaking process when there is broad consensus around a standard. This is an important tool in DOE’s toolkit and could have substantial implications if changed. The process that the DOE uses to set standards works well, gives manufacturers predictability for their product development, and results in lots of energy savings for customers. Furthermore, standards must be cost-effective, meaning that any upfront cost to consumers is more than made up by the savings on their energy bills because the products were made more efficient. Take, for example, the efficiency standard for clothes washers. The initial standard was established in 1987, and has been updated multiple times since then. Most recently, a 2010 negotiation between efficiency advocates, manufacturers, and consumer groups led to a two-tier improved standard. The first tier of new efficiency requirements took effect in 2015 and the second tier became effective just days ago on January 1. The average new washer in 2014 used 75 percent less energy than one in 1987, and the standard that just took effect means consumers will save even more—all while maintaining the performance of the machines. In fact, many consumers aren’t even aware of changes to the efficiency standard when they purchase new equipment, except when they see a decrease in their energy bills. This process gives manufacturers much-needed predictability, too—they know what’s coming and have lots of time to transition their product lines to comply. The processes DOE already follows enable these kinds of great results. Meanwhile, the DOE has already missed legal deadlines for upgrading a number of standards, and more deadlines are quickly approaching. There is still enormous room for improvement to existing standards, with the potential for an additional $65 billion in utility bill savings by 2050. Even if process improvements are warranted, DOE shouldn’t use such changes as an excuse for inaction on the standards it is legally required to review—doing so puts real benefits to all of us at risk.